I had a good night’s sleep at the train ride from Hue to Hanoi. I was originally bunked with three Europeans who were on a tour but their guide exchanged berths with me so they could be together which was swell as he a lower berth. The compartments were old but kinda clean by Vietnamese train standards. Opposite me was an elderly local who was very very quiet while on the upper berth was occupied by a European couple. I stuffed myself silly with the bahn bao I bought earlier. I managed to sleep and woke-up as the train was about to pull into the Hanoi station at dusk. It was drizzling and with all the confusion with trying to get a cab, I got one with the aid of a tout. I did ask to use the meter which apparently ran faster than the train. The driver dropped me off at the hotel with a 300,000 bill which should have been just 70,000. Oh well. I think it was better to just have negotiated the price up front. The receptionist at the Hanoi Atlantic Hotel along Hang Cot was very apologetic as he wiped away the sleep from his eyes. I think he was supposed to pick me up as he quickly put aside a piece of paper that had my name on it. My room was okay. Kinda small with a large and comfortable bed but very clean. I got a few winks in around 5:30. 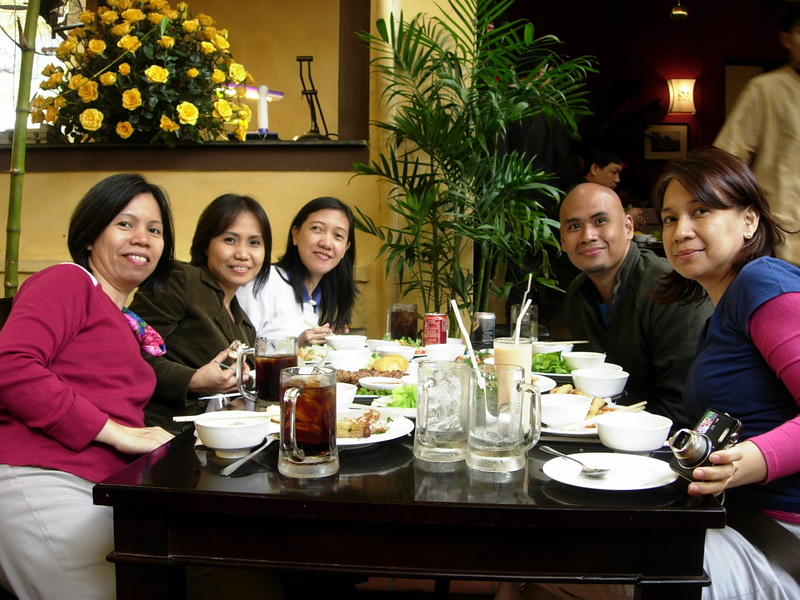 At around 8 in the morning I made my way to Little Hanoi Hotel ll where Rhoda, Jeannette, and Julie were. They had arrived in Hanoi from HCMC the night before. Fortunately, Hang Ga is the continuation of Hang Cot. I would later learn that streets in Hanoi’s Old Quarters sometimes change names when they intersect with another street. Thus Hang Cot becomes Hang Ga which later becomes Hang Dieu. After a week of traveling alone and amidst strangers, it was a pleasant sight to see Eva on one of the computers at the hotel’s lobby. The other three were still in their room and getting ready. Little Hanoi was a beehive of activity as people were coming and going while Lily, the receptionist who spoke English very very well, was attending to everyone. She’s by far the coolest and most helpful hotel staff I’ve ever met. I rented a car for the day ($ 60) to take us to the sights. 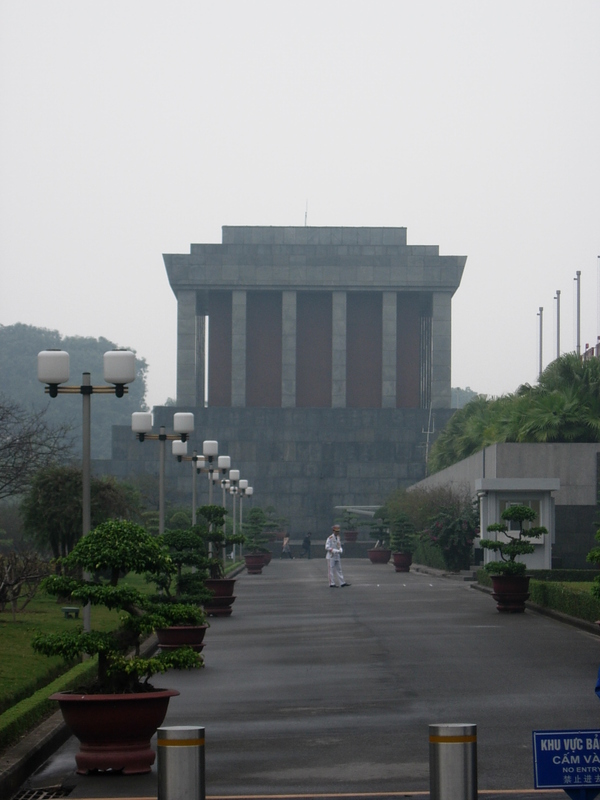 It was past 10am by the time we got to the Ho Chi Minh Mausoleum Complex where venerable Uncle Ho is on display. If anyone is wondering why there are hardly any pictures of this big big park and its sights, its because bags and cameras were asked to be left at a counter near the entrance. What was weird is that we seemed to have been one of the few ones who actually left their cameras behind as all around us people were happily snapping photos, even at the museum! As expected, the entire thing was one touristy affair especially at the area of the One Pillar Pagoda which was filled with people. It didn’t look quite as tranquil or elegant as it does in pictures. Everything closes at 11 so we simply stared at the mausoleum from the sidewalk. Guards shooed anyone who even dared put a foot on the pavement on the square facing the mausoleum. It was a really big disappointment. Sigh. When we returned at the counter to get our stuff back, it had magically transformed itself into a souvenir stall! Gone were the guys in green security uniforms issuing numbers and taking the little bags that housed the cameras. We showed our numbers to the vendor and he gave us our bags. We had lunch at Quan An Ngon where we broke Rule # 1 of dieting: Never order when you’re really really really hungry. We were spoiled for choices and ordered a dish too many— friend rice, spring rolls, shrimp on sugarcane sticks, pork with rice flour cake, and many more. After days of watching what I eat and how much, I guess simply went berserk. Or maybe I was just too happy that I actually had company to eat with. The place was quite full and we were lucky to get ourselves a nice table. This really popular restaurant is probably the best place to sample a variety of Vietnamese dishes at a nice open-air setting. Servings were plentiful and you could simply go to the open kitchens to point out what you like in case words on the menu fail to stir your imagination. The next two stops were particularly hilarious as: (1) we didn’t explore the entire Temple of Literature and (2) we went around the entire block of the Temple looking for the Fine Arts Museum. The Temple of Literature is one of Hanoi’s IT sights. What is undoubtedly a haven of piece in the middle of Hanoi’s chaotic traffic wasn’t what greeted us with crowds of people thronging the courtyard with its main temple housing Confucius and the halls that had been converted into souvenir shops. 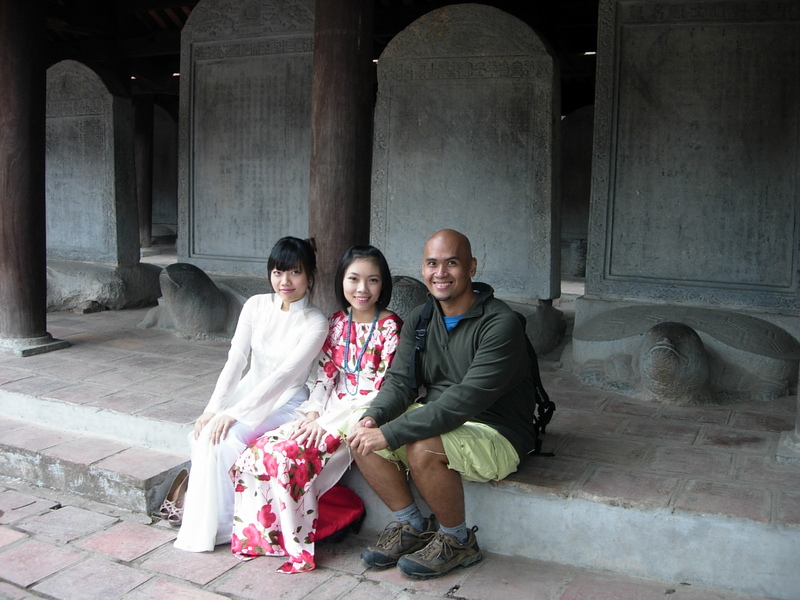 Like a Disney theme park, pretty young girls in graceful "ao dai" were on the grounds ready to pose for snappy-happy toursits like me. We only realized that we had missed the innermost and probably the best part of the temple when we were walking outside the temple’s perimeters in search of the Fine Arts Museum. None of us even bothered to go behind the main temple where apparently there was a entrance. I had misread the map and we circled the entire block of the Temple of Literature before we realized that the Fine Arts Museum was just across! This wasn’t the first time I got disoriented. I circled the entire block of the National Museum in Phnom Penh when the Royal Palace was just beside it! 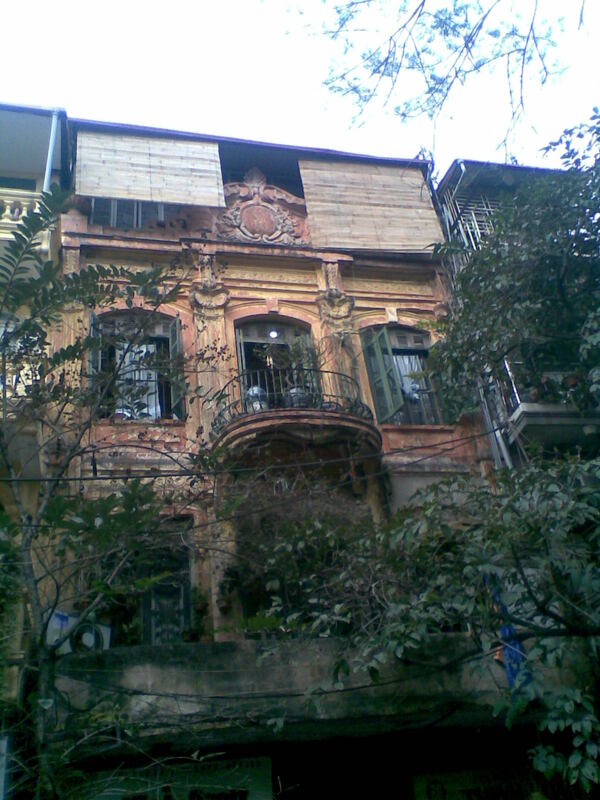 More splendid and awe-inspiring was the Museum of Ethnology. 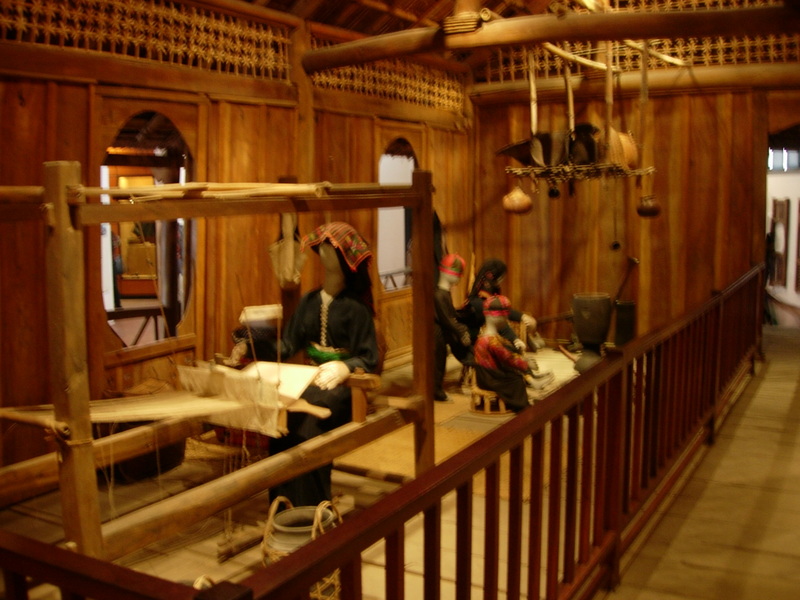 I totally envied this museum which had creative and very informative exhibits on the culture and customs of Vietnam’s ethno-linguistic groups. The buffalo pole used for rituals that greeted visitors at the lobby was particularly interesting with its colorful buntings and its construction that allowed the upper pole to swing around when tied to a buffalo. Life-sized displays of rituals such as the H’mong burial and the Dzao wedding were well-presented. An even more brilliant idea were the videos showing the actual real life contexts of the displays. 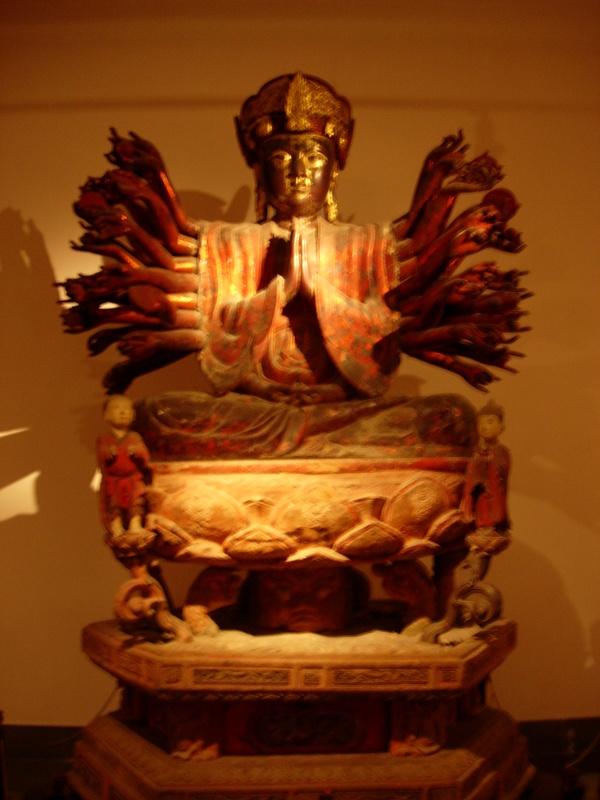 Most interesting of the artifacts were the funerary statues of Giaria of Central Vietnam. 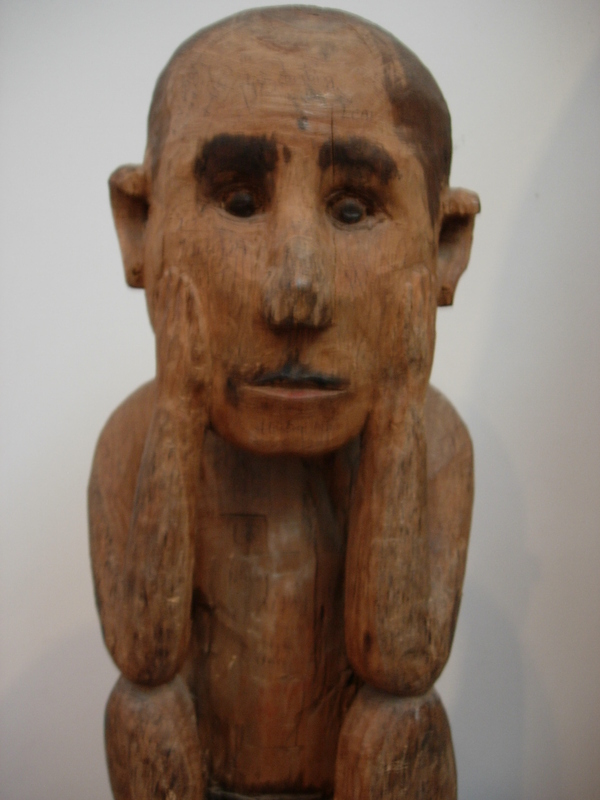 The wooden icons all had varied expressions. 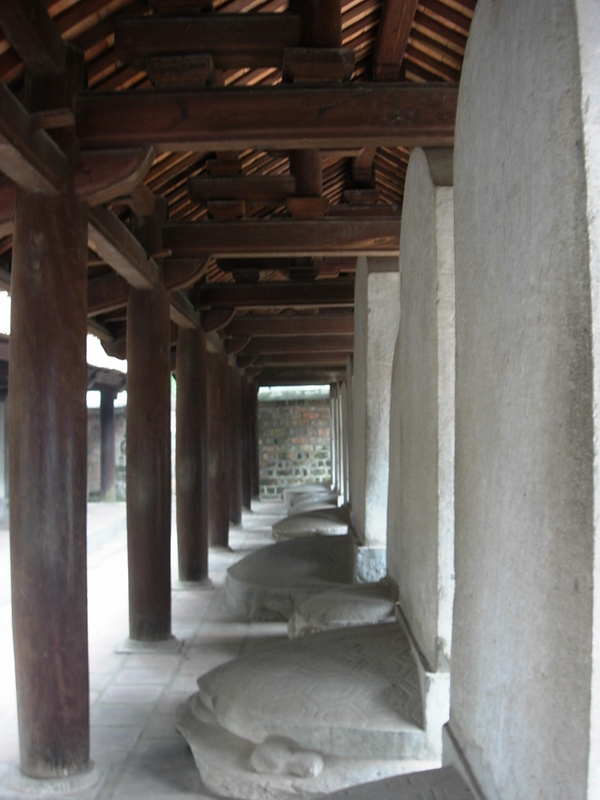 They were placed around burial houses to accompany the dead to the after-life. 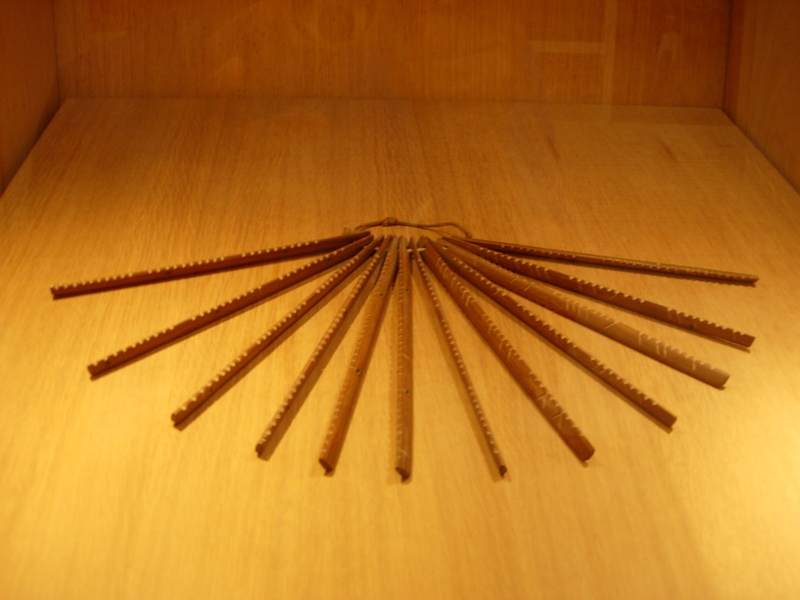 This is one cool lunar calendar shaped like a fan and made from bamboo. From the Muong people. 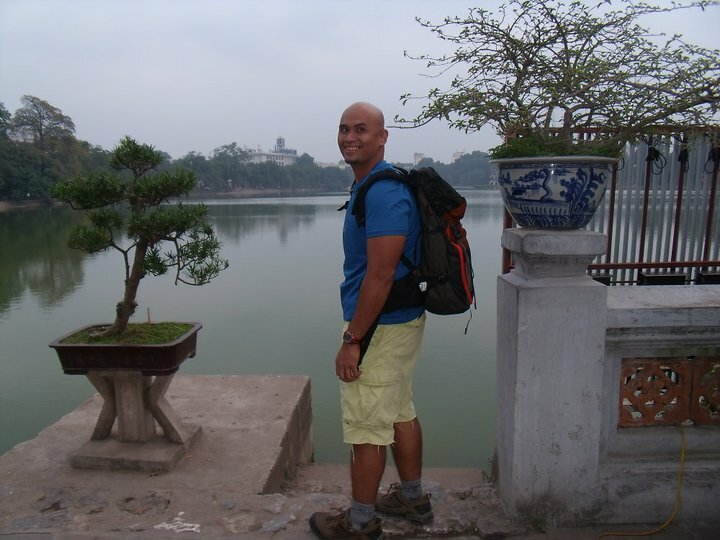 Our last stop was Ngoc Son Temple at Hoan Kiem Lake. The tiny temple had a stuffed giant tortoise on display. It was really huge and all leathery. More interesting were two colored photographs of tortoise sightings on the lake. I was a little disappointed with the lake maybe because I had Hangzhou’s West Lake pictured. 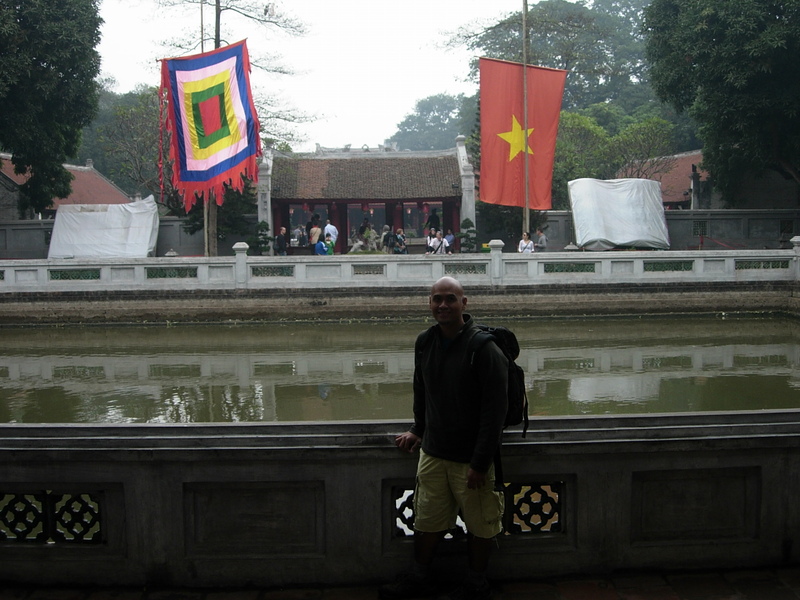 Hoan Kiem was definitely smaller and had none of the leafy promenades of Hangzhou. Perhaps it’s best appreciated early morning before tourists start filling its pretty bridge. The iconic Tortoise Tower stood on the far opposite of the temple. Is there a tortoise hiding somewhere here? Just across the lake is the water puppet theater. All tickets for the dates we wanted were all sold out so we settled for the 2pm show on January 1 instead.